I’ve come up with a rather casual, and very preliminary approach to mapping the range of mental health in the three primary dimensions of the self, physical, emotional, and intellectual. (Take a look at the large version of it by clicking on the image. It should open in a new window in most browsers.) It’s something I’ve been working on for a year or so now, starting out as just a one dimensional map, and finally making it into a more robust and realistic 3D map in very, very “low res” (essentially 3 x 3 x 2 plus a bit extra information from part of another axis). This is definitely a work in progress, it’s got a lot of awkwardness and missing information that I feel needs to be included. But I thought it was a good enough baby to let it wander around out in the big ole world to get some feedback on it, and offer it as a bit of inspiration to others who might want to play with the little pup. Of course, in talking about “mental health”, we realize quickly that it is a seriously complex concept which involves all elements of the personality. This is why there are so many different categories listed in those infamous DSM books. But if we take a systematic approach, we can start to break mental health categories down into some of their basic, objective, components, using the most general types of relationships that individuals have in life — internal first person types and external second/third person types of sharing of sensory data — and into levels of overall “mental health” (which is likely to be indicative of fourth person connections, though I’m not sure). Separating these elements out in this simpler way, we can see how the different sets of long term behavioral approaches to life relate to each other, and what they offer society when they are taken care of and when they are not. Internal Reality — Physical — The vertical axis shows three levels of increasing levels of first person connections. First person being the sharing of information within oneself (being aware of and attentive to one’s own internal state). The more connected you are with yourself, the more information you will get about your internal state, and the higher your level will be on this graph. External Reality — Emotional and Intellectual Combined — The horizontal axis shows three levels of second and third person connections. Second and third person being the sharing of information between oneself and everyone else. Evolutionary Reality — Spiritual — The two halves of the graph that are the best/worst “axis” shows (I think) two opposite levels of fourth person connections. Fourth person being the sharing of information between oneself and the whole system of life~evolution. The “best” half of the graph includes those individuals who actually have effective relationships with life as a whole (you could say that they are “going with the flow” within the river of time that is creation~evolution). These individuals are what we tend to call “mentally healthy” and are able to pass on positively valuable art, memes, and xemes to future generations, while the “worst” half of the graph indicates what happens to the same set of personality types if they are seriously deficient when it comes to healthy connections to the life process, and thus they are likely to end up at an evolutionary dead end, after suffering painful bouts of mental illness. Thus, for example, the top left personality on the green graph is the same personality as on the top left of the purple graph, but the former has their physiological needs being met by the environment, while the latter does not. The shade of the colors on each half indicates the ability of each personality type to affect change in society. It’s a general indicator of social power levels with darker shades being more powerful. The most change comes from individuals who are extremely internally driven while also having a significant, but not total, drive for external connection as well (the top center category is the peak), so that there is an internal motivation to change the world, while also being able to relate to the external world well enough to inspire followers. The overall goal of presenting this approach to systematically categorizing the dimensions of human behavior is to help people see both where everyone fits, in relation to the matrix of the whole social system, and also to see what an individual’s potential is, given a supportive community that collaboratively works to serve each individual’s health needs (high quality food, water, air, warmth, sunlight, and welcoming outlets for the body’s excess matter and energy), and what happens when their community fails to meet their needs. One can figure out what category, or set of neighboring categories, one tends to fit into in life, and use the green/best chart to see how one might be most valuable to society, and make sure to use that as a goal in clarifying the very practical reason why one needs the community’s active support in getting one’s basic needs met. When the community takes care of your basic needs, in return you will be able to effectively serve in one or more of these socially beneficial roles. You might notice that I’ve stayed away from naming particular “official” mental illness terms here, because I want to keep people thinking more realistically about behaviors and mental illness/health, so we’re able to put things into a more practical social context than the old fashioned, mostly static, corporate influenced, academic models of mainstream psychiatry that come with a huge dose of irrational politics. But if you’re curious about where some particular “diagnosis” fits into this, let me know and I’ll try to give you some coordinates. And as a general rule, folks on the right side of the graph are more mainstream/conservative/traditional, while those on the left are more liberal, innovative, and “interesting” compared to current social “norms” of their time period and geographic region. Also note that younger folks, who naturally have lower levels of connection to their own internal and external reality, will tend to fit into the lower left categories until they mature, at which point they will most likely move up and/or to the right of the graphs. Though some people only move a small amount and stay in the same general category even as adults and end up having very stable, simple personalities all their lives, especially if they aren’t educationally allowed and encouraged to explore their inner and outer realities. Younger people, however, are generally more spiritually~evolutionarily connected, because they haven’t had their instinctive behaviors messed with by the artificiality of society, and will most likely be mentally healthier than adults with the same environmental conditions. For an example of how an individual might place themselves in this map, I would say that I hover around the intersection of the four top right categories with a strong internal “self awareness” connection and a low-to-middling connection to others in society. At my worst, I have definitely been a hoarder, suicidal, up-and-coming rebellious activist, and fully invested myself in some pretty lame jobs out of desperation to meet my basic needs (and have had at least mild heart problems, too). But these days I am very much in the “best” side of evolution as I devotedly serve my employers (the forces of nature!) in spewing out evolutionarily positive art, memes, and xemes that promote innovative programs for using personal inspiration and physical health as a way to lead the world to a far better future, which is what you might expect from someone who is a combination of eccentric creative genius, great leader, curiosity collector/researcher/maker, and decent loyal worker. :-) How about you? Can you figure out where you might be? What important role do you think you would serve in the world if your needs were really well taken care of by your environment? As for the reasons why particular individuals are in the personality categories they are in, that has to do with all sorts of factors, mostly involving what happened to them during the very early physical and emotional growth stages of their lives, from conception (DNA and RNA and basic physical structure of the body/brain) to 3.75 years old (structuring the basic understanding for what familial and friend bonds are useful for), and also to what happened to them during the school and young professional years (learning about what we are good at and how that might serve the community’s needs). All learning experiences, at all levels, play at least some part in building our personality, even if the younger years are the most formative, which is why no matter where you are in the map now, you can continue to move upwards and/or outwards, at least a little, as you are able to bring more high quality mental and physical resources into your self. Phew! OK. I’m done for now. Your turn! Note, I’ve updated the diagram. I like it a little better now! Regularly clarify and publicly share your most important goals in life. Be gracious about accepting or declining all offers of resources intended to help you towards your goals, by thanking those who offer them. Ask for clarification on how offers might be used to achieve your goals if it’s not immediately clear to you. Pick the best options you’ve got and go for it. Whenever your attempts to reach your goals cause conflict with someone, sincerely apologize for causing problems for them (your most important goals aren’t to cause harm to others, are they? ), offer to help them restore their balance with any truly excess resources you might have, and then start the cycle over again with Number One, and re-clarify what your goals are and then publicly asking for help in finding a way to get what you’re seeking in a way that doesn’t cause problems in the future. The intention of love and the effectiveness of love are two entirely different things. When people say they love you, they are expressing their (possibly only subconscious) intention to support your needs so that you can be a physically, emotionally, intellectually, and spiritually (life-centric thinking) healthy individual. They might very well not be able to do that, due to their own physical, emotional, intellectual, and spiritual deficiencies and/or toxicities. For their love to be made a reality, they need to actually be successful in helping you get the truly nutritious food, clean water, fresh air, warmth (including touch), sunlight, and welcoming outlets for your excess solids, liquids, gases, and energy that you need to grow healthfully in all dimensions. This list of elements is nothing more than our common English names for the forms of matter (solids, liquids, gases) and energy (heat and light) that intelligent social mammals need to input and output in order for their bodies (including the brain/mind) to grow. 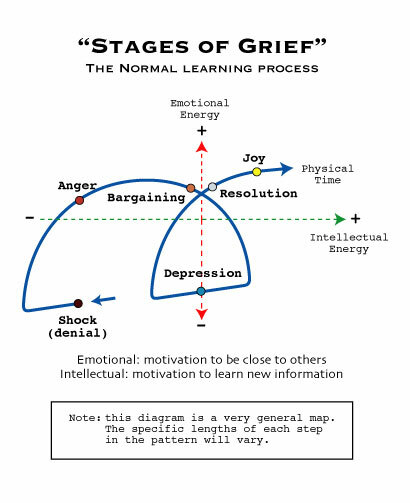 the stages of grief are loopy! Two steps forward and one step back is indeed an accurate way to describe the life process, at least from intellectual perspective. In the expansionary process of moving forward, we often get hit by forces far stronger than we planned for, needed, or can even effectively deal with. So we have to contract again, going “backwards” in some sense. Most of the time a small step backwards is sufficient for us to regain our stability and balance, and be ready to find a use for whatever is thrust upon us, or to find a way around it. Occasionally, if we’ve ended up with a overwhelmingly challenging overabundance of something — physical, emotional, intellectual, or spiritual — that we can’t work with or around, and it becomes a serious toxicity, we might need to take many, many, many steps backwards before our balance can be restored. People may not understand this process of expansion and contraction that comes with major turbulence in one’s life. They might not realize that your anger and subsequent temporary stepping back is crucial to your long term progress. And they may not realize that the relative sizes of the different stages will vary drastically depending on even the tiniest differences in circumstances (the strength of the shock and the usefulness of the resources available to you for healing) leading to one situation taking one individual years to complete the process, and another individual, with a superficially similar situation taking just minutes to heal. This lack of understanding is yet another challenge you might face sometimes, but, perhaps seeing this information here, during a more intellectually positive moment in time, will help solve that problem reasonably effectively. Knowing that denial, defensiveness, making unreasonable demands, and eventually the total loss of the ability to think clearly and relate to others on a personal level are all necessary and normal parts of the healing~growth process which must happen before one becomes open to, and capable of creating a new solution for going forward that works more fully with the reality of things. Expand – Encourage the most diverse range of animals, vegetables, minerals, and otherwise, to join your system as possible. Every unique element in the world has different things it inputs and outputs, and for every individual who needs X, there is another individual who produces X in excess. The more diversity you have in your system, the more chances there are of everyone getting what they need from someone else. Not everything will work in every ecosystem on the planet, but, within your region of the world, there will most likely be something that fills every need. Everything that voluntarily joins your system is valuable in some way, even if it’s not obvious right away. Contract – Reduce the size of your resource footprint as much as possible by bringing symbiotic elements closer together, so that you meet more of each individual’s needs closer to where that individual usually is. This reduces waste both in the sense of making it easier for everyone to get their needs met, but also in the sense of putting surpluses to better use. This process is sometimes called “closing the loop” and making the system more independent and self-sufficient, and results in the three R’s of reduce, reuse, recycle. Rather than having what you need shipped in from elsewhere, find a way to use what you have in abundance to serve the same purpose whenever possible (i.e., collect rainwater and use “weeds” as mulch and compost, rather than getting water and fertilizer from some outside source). Stay Still – stop and observe how things are flowing around you. Use your observations to better reduce conflict and create more symbiosis within all the individuals in your system. Also, use your stillness to remind yourself to mostly stay out of everyone’s way, and let them have as much freedom as possible so that they can more easily do what they do best. Thinking about human relationships in a fractal way, you might come up with the idea that the most intimate love relationships, at least for a heterosexual human couple, function in a similar overall way to the way the most intimate relationships between an egg and a sperm do. Generally for an egg, she only lets in the most persistent, consistent guy who actively seeks to not only get past her hard exterior shell that is her personal boundaries, but who also does so in a fully vulnerable way that gives all of himself to her, literally letting her absorb him. He is rewarded with a permanent lifetime commitment by her to give him the chance to combine the best he has to offer the world with the best she has to offer the world in an act that could be called the most powerful creative force known to humanity. Most sperm don’t ever make it. And most eggs never find that special sperm. But the guy who is persistent enough and strong enough to get past the woman’s boundaries to fully offer his whole self to her, will always and forever be the one whom the egg totally bonds with for the rest of her life. In another example of the world becoming more creative, even in some of the most mainstream places, the legal system in at least some US states (and probably elsewhere, as well) is beginning to experiment with mating the two parents of for-profit businesses and non-profit organizations for a new and improved creature that shares some of the best of both. The best parts of for-profits are the motivation to innovate and to find ways to be highly efficient when it comes to resource use. The best parts of non-profits include the motivation to improve the quality of life for some particular community (be it physically, emotionally, intellectually, or spiritually based) and to do so without constantly feeling forced to give valuable resources to those who don’t actually need them (via corporate taxes and profits). Right now, in the US states of Maryland, Vermont, and New York, there is a first baby step at creating something like this. They are calling it the Benefit Corporation, or B-Corp. This category of business allows a company to put bylaws in place that leave some freedom for company leaders to choose to put social~environmental priorities above monetary profits. This particular offspring of for- and non-profits still misses out on number three up there, and doesn’t fully put numbers one and two at the top of the goals list, but it’s getting closer to the sort of creature people like me are looking for – being officially recognized as doing pro-world work while also having more political and monetary freedom, so that we can more easily move resources around to best suit the community’s needs, and speak out when doing so might be the best way to solve the everyone’s problems. The philosophical way to describe this sort of category might be to say that it’s a utilitarian company – using company resources to achieve the most long term benefits for the most individuals is a goal that comes well above gaining short term benefits and/or benefits that go to only a few individuals. Of course, as no situation in life is perfect, there will always be at least some conflict when it comes to serving the needs of the individuals doing the work and the needs of the community they are working for. This is why we have more than one category for approaching work. For-profits put the priority on trying to serve the needs of the legally recognized “owners” of the business (either the stock holders, the creator, or the workers). Non-profits, of course, put the priority on trying to serve the needs of the community. And now we’re starting to legally acknowledge that there are at least some folks out there who are excited about trying to find ways to do both at the same time, which is definitely a good start in working with the not-just-black-or-white reality of complexity and evolution.